At a local auction in a small town in New Jersey, two days ago, a small painting of a fainting woman was sold for $870,000, a thousand times more than its high estimate. The buyer and underbuyer were betting on the chance that it is one of the earliest paintings by Rembrandt. Schwartz thinks they were making a good bet. A painting catalogued simply as “Oil on Board, Triple Portrait with Lady Fainting” sold today, 22 September for $870,000 at Nye & Company Auctions in Bloomfield, New Jersey, against an estimate of $500-$800. 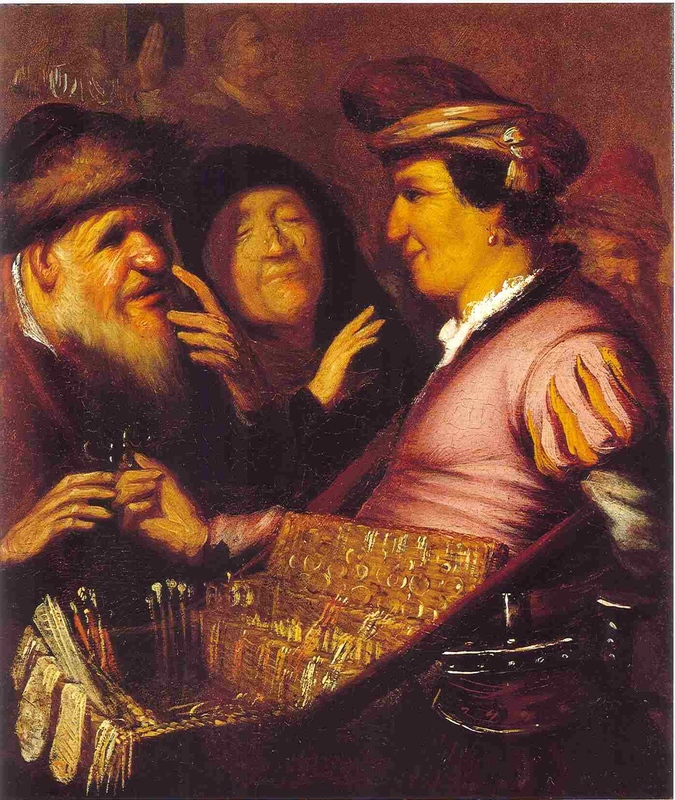 The sleeper hit (lot 216), is believed to be a long-lost panel by a teenaged Rembrandt. 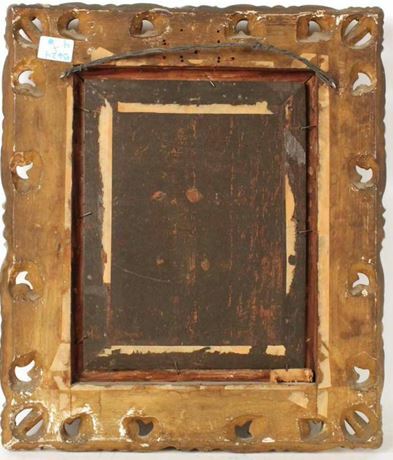 The 12.5 in x 10 in panel was described by the auction house as “Continental School, 19thC, appears unsigned”, and potential buyers were advised that the condition included “paint loss, some restoration to paint, wood cracks”. 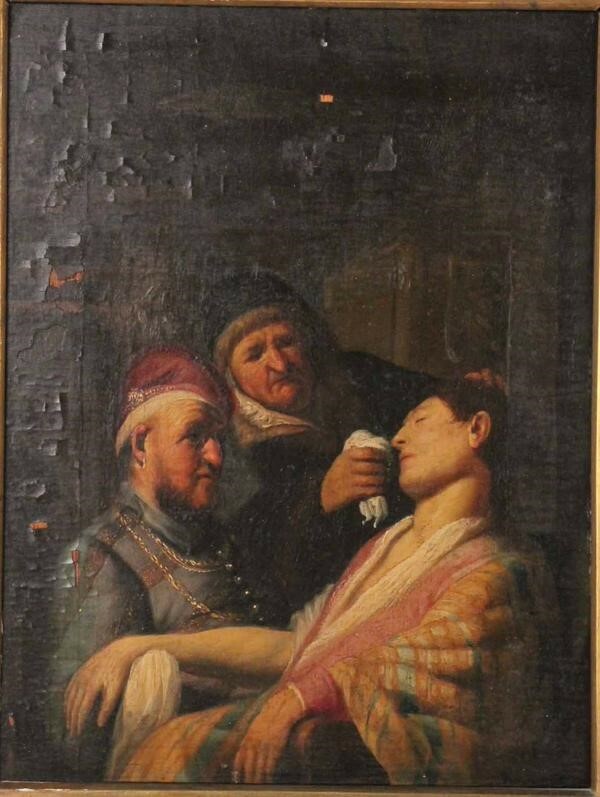 The painting shows an unconscious young woman with a handkerchief (presumably holding smelling salts) held to her nose by an older figure, while a man (perhaps her husband) looks on. Three others from the series are known: The Operation, The Sense of Touch and Three Singers, the Sense of Hearing are owned by the New York collector Tom Kaplan of the Leiden Gallery, New York, while The Spectacle Seller, The Sense of Sight is in the Museum de Lakenhal in Leiden. 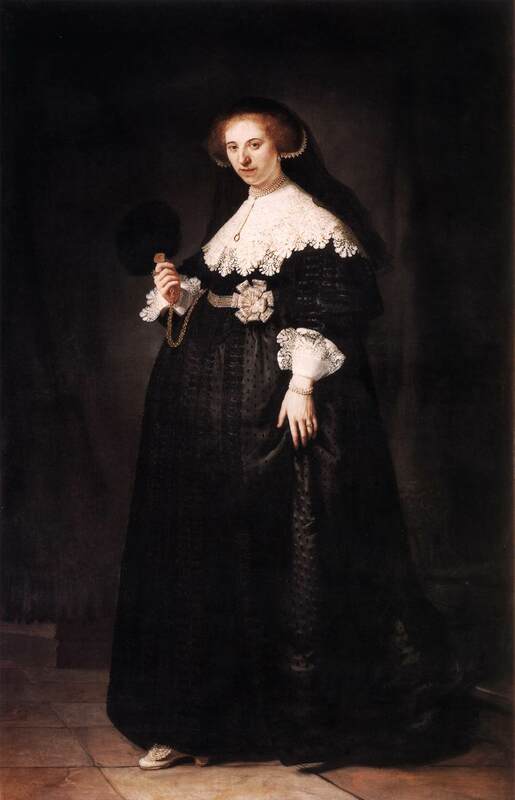 Judging from the poor images available, the painting fits perfectly into that missing niche in Rembrandt’s oeuvre. The conception of the subject, the way the emotions and sensations are depicted and the figure types match to a tee the other three known paintings of the senses. Even the difference in size corroborates the supposition that it belongs to the same series. The other three paintings were enlarged early on to the size of the New Jersey panel, 31.75 x 25.4 cm. If the new panel turns out to have added pieces reaching these dimensions, with an embedded panel of about 21 x 17.5 cm., as do the others, this will clinch the case in the aspect of physical properties, leaving little room for doubt that they are by the same hand, Rembrandt’s. The remark in the auction house description concerning “wood cracks” hints that this may be the case. An image of the back of the panel, illustrated above from a tweet by Rembrandt’s room, does not solve the issue. Are the angled cuts on four sides just bevelling on a whole panel? If they are added pieces of wood, are the dimensions of the smaller interior really no larger than 21 x 17.5 cm., the size of the other panels? They look bigger. If the panel is however an integral 31.75 x 25.4 cm., the possibility must be considered that it is a copy after a lost Rembrandt. 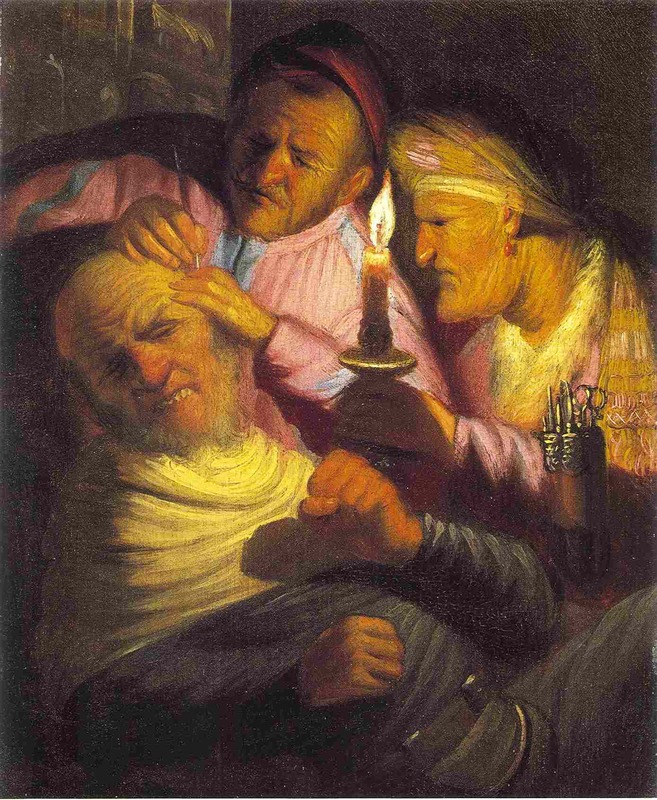 Another, slimmer possibility is that some of the five senses were originally smaller, that Rembrandt decided midway through his series that a larger format would be better, changed to the bigger size for the last one or two paintings and added strokes of wood to the three that were already finished. In 1984 I wrote of the three known paintings: “There is every reason to assume that these three paintings of the senses (where are the other ones?) are the earliest surviving works by Rembrandt, although not all scholars agree on this.” (Rembrandt, his life, his paintings, New York 1985 [published in Dutch in 1984], p. 34.) Among the scholars who had their doubts were the members of the Rembrandt Research Project, which in vol. I of A corpus of Rembrandt paintings saw weaknesses wherever it looked. However, the RRP did not reject the possibility that they were made by Rembrandt, a position embraced in vol. VI by Ernst van de Wetering, with interesting remarks. How nice that one of the other two has now surfaced in Bloomfield, New Jersey. The manner in which it emerged, in an auction house not used to handling old masters, with a low estimate, is proof enough that the painting is not a new forgery. It is the same pattern of events by which the self-portrait on copper now in the Getty Museum returned to sight in 2006, in a farming auction house in the Cotswolds. This exciting new discovery should encourage anyone with an old painting of a certain quality to consult an expert on the possibility that it is a missing masterpiece. To start with, take a second look at any panel painting measuring 31.75 x 25.4 cm. depicting the sense of taste. But don’t stop there. Forgotten masterpieces can be retrieved in the most unlikely places. If it can happen to Rembrandt – twice in a decade – it can happen to anyone. © Gary Schwartz 2015. Published on the Schwartzlist on 24 September 2015. Slight changes made in the following days, in part to remove expressions of mild doubt that the painting may be a copy after a lost Rembrandt. P.S. After posting the above, I realized that the image of the painting provided by Rembrandt’s room was better than I thought. Click on it, and it enlarges, revealing far more detail. These details show clear breaks in facture, color and condition around the central motif. By measuring the ratio between the whole image and the central one, I arrive at dimensions of 22.8 x 18.1 cm. for the latter. This is pretty close to the 21 x 17.5 cm. of the three other paintings. This picture does not correspond to what we see on the back of the painting, which really looks like one bevelled panel. A possible explanation for this is that Rembrandt started painting the series on the small, cramped scale of the central motifs and decided when they were finished that he would prefer a more commodious format. Thereupon he pasted the original paintings onto larger panels, which he then filled out with surrounding slats that he painted to enlarge the compositions and the space. Two early readers of the column let me know that they think the fainting person looks more like a young man than a woman, and I am inclined to agree. 24 September 2015, 20:00. P.P.S. Otto Naumann referred me to an article by himself and Quentin Buvelot: “Format changes in paintings by Frans van Mieris the Elder,” The Burlington Magazine 150 (February 2008), pp. 102-104. They illustrate and discuss a number of panel paintings by van Mieris that were enlarged by the artist during the creation of the painting. Concerning the Rembrandt series, he wrote in a mail: “All the small panels in this series had been ‘let into’ larger panels; in other words, the larger panels were gouged out and the smaller ones set and glued into the created depressions. This was common practice.” Naumann is convinced that this was not done to the Rembrandt panels until late in the seventeenth century. This judgment is borne out by information kindly provided by the former owner of The sense of hearing, Baron Willem van Dedem. He let me know that before he had the added strips of wood removed he had a dendrochronological examination performed that dated the wood to the end of the seventeenth century. In the light of this evidence, I can only withdraw my suggestion that Rembrandt was responsible for the format change. Nonetheless, given the close fit between the newly discovered Sense of smell and the other three early Rembrandt paintings of the senses, I have removed the question mark in the title of this column. 25 and 26 September 2015. I had not been expecting to go online with another column so soon after installment 341. But this development is too exciting to let pass by. Another great Rembrandt event of the past week was the announcement by the Dutch minister of Education, Culture and Science, Jet Bussemaker, that the government is contributing half – 80 million euros – to the purchase price of two Rembrandt portraits from the collection of the French Rothschilds. I have no doubt that the director of the Rijksmuseum, Wim Pijbes, will be able to raise the other half. As yet unannounced in the Dutch press is a report in Les Echos that the Rijksmuseum is to collaborate with the Louvre and purchase the paintings jointly, for shared display. The announcement of this unique procedure is credited to Jean-Louis Martinez, the director of the Louvre. Strange that Bussemaker said nothing about it. P.S. A tip by a reader alerted me to the fact that the plans for collaboration had been discussed at length over the past year, but that the Dutch were now proceeding with the purchase on their own. 24 September 2015, 20:00. P.P.S. On Dutch radio last night and this morning, it was reported that the Louvre was indeed still in the picture, and that it was making a bid to purchase one of the two portraits. One authoritative source for this development was a late posting by Le Monde the evening of 24 September. It would seem that the French have second thoughts about letting the paintings leave the country, and have now gone into competition rather than collaboration with the Rijksmuseum. The Dutch are not likely to back down on their intention to buy both portraits. Bussemaker has even announced that the two portraits are to be displayed at venues throughout the Netherlands, to show Dutch taxpayers what they are getting for their 80 million euros. So many things about this story are uncertain that it would be wise not to bet on the outcome. That wise I am not. The mood in the Netherlands is excited anticipation, in France recriminative regret. I think the Dutch will carry the day. 25 and 26 September 2015. Canvas, 210 x 134.5 cm. Canvas, 209.5 x 134 cm. 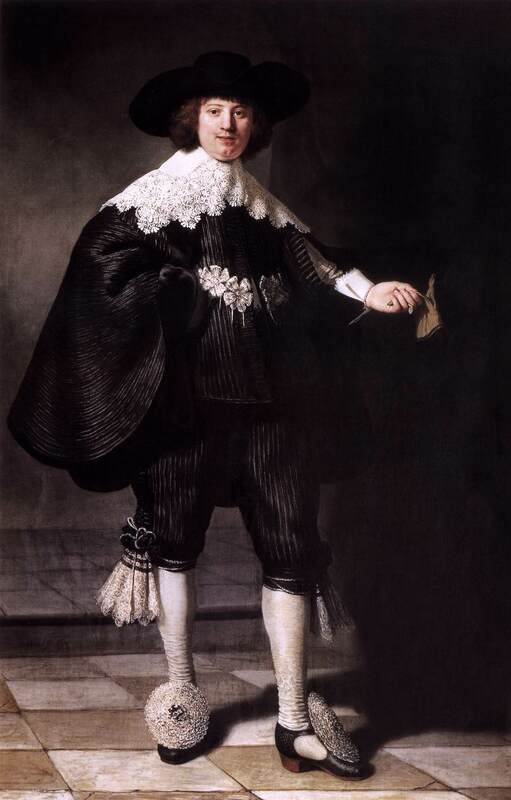 These life-size, full-length paintings are the greatest show-off portraits of the Dutch seventeenth century. (In Dutch I would call them pronkportretten.) They descend from Titian’s imperial court portraits of the sixteenth century through van Dyck’s renditions of the Italian and English aristocracy, on the way to Hyacinthe Rigaud’s glorifications of Louis XIV. They are the ultimate upending of the cliché about the sober Calvinism of the Dutch. Too bad that the Rijksmuseum does not have examples of Italian, Flemish and French art to display them in the grandest of their contexts. Well, in my opinion, if it is a Rembrandt and he had painted that painting, I think that it might have been a mighty cold day, and he just wanted to finish that left arm and then get the hell back in front of the fire and call it done. You know, maybe he did paint that painting, that is if he painted that one above it, the eye glass seller. It looks to me like he might have had a problem with the hand and forearm in that painting also, unless he was just having a bad day. I’ve alway heard that Rembrandt did had a problem painting arms and hands and sometimes he just leaving them vague. You don’t suppose someone could have misappropriated just short of a million dollars do you? Well, they can always sell the works to some other Museum,… You know, one of them who have been known to buy works that are questionable.